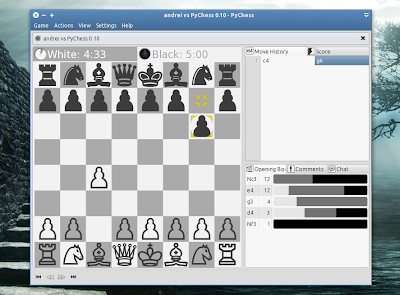 PyChess is a chess game originally developed for Gnome but it runs well under any DE because it's developed in Python. You can play against the computer (PyChess comes with many difficulty levels) or play agains a human beging by connecting to the FICS servers, a big chess community with options to chat, observe games of others and more. PyChess 0.10 was released a few days ago, bringing support for chess variants: Fischer Random with your majors huffled, play Losers chess with being mated as your goal, or simply play odds chess as an additional way of giving a player a handicap. The new version also brings online chat support (you can also chat in various FICS channels, not only with your opponent), 8 different play difficulties when playing against the computer and more. Check out the PyChess 0.10 release notes for more info. Thanks to Grof Aty for the tip!